You may not know it, but the answer is yes. In fact, you know many ALICEs. 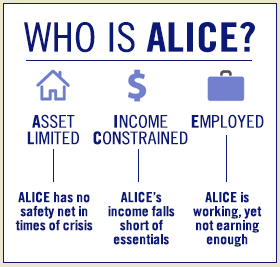 ALICE is a United Way acronym for Asset Limited, Income Constrained, Employed. United Way of Pierce County partnered with the United Ways of Pacific Northwest to develop the ALICE report, providing a comprehensive picture of financial need across Idaho, Washington and Oregon beyond traditional federal poverty guidelines. Before this study, ALICE was a population and community issue without a name or face. ALICE represents the men and women of all ages and races who get up each day to go to work, but who aren’t sure if they’ll be able to put dinner on the table each night. ALICE is your child care worker, mechanic, home healthaide, store clerk, and office assistant – all workers essential to you and to our community’s success. Sadly, the number of Pierce County households who are ALICE – living paycheck to paycheck, struggling to afford life’s basic necessities – far exceeds official federal poverty statistics. Despite the combination of ALICE’swages and some public assistance, ALICE households still face an average 25 percent income gap in order to reach financial stability. Based on the newly developed Household Survival Budget, it takes more than double the U.S. poverty rate of $23,550 for a family of four to afford the essentials. Despite working, ALICE and poverty-level households often need assistance to meet their most basic needs. Frequently, many of these households are still unable to make ends meet on a monthly basis. This gap in income forces families to make tough decisions like whether to pay an electric bill or fill a prescription, buy food or fill their gas tank. ALICE provides vital services to our community – such as child care, health care, security, and retail services – yet is unable to make ends meet on the income these jobs provide. The Pierce County economy is increasingly dependent on low-paying, service jobs. More than half of all jobs in Pierce Countypay less than $20/hour ($40,000/year if full-time). These jobs are projected to grow at double or triple the rate of medium- and high-skilled jobs over the next decade across Pierce County. ALICE is men and women, young and old, of all races. Nearly 20 percent of the ALICE population is white while 37 percent are Hispanic, 29 percent African American and 17 percent Asian. Black and Hispanic households are still over-represented as a percentage of ALICE households, but overall, the race and ethnicity of ALICE households fairly closely mirrors that of the Pacific Northwest population as a whole. With the cost of living higher than what most wages pay, ALICE families – an acronym for Asset Limited, Income Constrained, Employed — work hard and earn above the Federal Poverty Level (FPL), but not enough to afford a basic household budget of housing, child care, food, transportation, and health care. ALICE households include women and men, young and old, urban, suburban, and rural, and of all races and ethnicities, and they live in every county in the Pacific Northwest. In Idaho, 15 percent (87,233 households) lived in poverty, and 22 percent (130,397 households) were ALICE. In Oregon, 15 percent (230,328 households) lived in poverty, and 23 percent (346,700 households) were ALICE. In Washington, 13 percent (343,878 households) lived in poverty and 19 percent (510,342 households) were ALICE. In Pierce County, 12 percent (36,274 households) lived in poverty and 22 percent (66,503 households) were ALICE. *The numbers for 2014 are 12 percent in poverty and 24 percent were ALICE. Why are there so many ALICE households in the Pacific Northwest? Low wage jobs dominate the local economy: More than half of all jobs in the Pacific Northwest pay less than $20 per hour, with most paying between $10 and $15 per hour ($15 per hour full time = $30,000/year). These jobs — especially service jobs that pay below $20 per hour and require only a high school education or less – will grow far faster than higher-wage jobs over the next decade. The basic cost of living is high: The cost of basic household expenses in the Pacific Northwest is more than what most of the region’s jobs can support. The average annual Household Survival Budget for a Pacific Northwest family of four (two adults with one infant and one preschooler) ranges from $46,176 in Idaho to $52,152 in Washington — double the U.S. family poverty rate of $23,550. Jobs are not located near housing that is affordable: Through the Great Recession, both housing affordability and job opportunities dropped steeply. Housing continued to decline slightly from 2010 to 2013 and job opportunities on average stayed flat, so it remains difficult for ALICE households in the Pacific Northwest to find both housing affordability and job opportunities in the same county. Public and private assistance helps, but doesn’t achieve financial stability: Assistance provides essential support for households below the ALICE Threshold but cannot lift all households to economic stability. Government, nonprofit, and health care organizations spend $21 billion on services for ALICE and poverty-level households in the region to supplement their income, but even that total is still 25 percent short of lifting all households in the Pacific Northwest above the ALICE Threshold. What are the consequences, and what would improve the economic situation for ALICE households? Consequences: When ALICE households cannot make ends meet, they are forced to make difficult choices such as forgoing health care, accredited child care, healthy food, or car insurance. These “savings” threaten their health, safety, and future – and they reduce productivity and raise insurance premiums and taxes for everyone.The costs are high for both ALICE families and the wider community. Effective change: While short-term strategies can make conditions less severe, only structural economic changes will significantly improve the prospects for ALICE and enable hardworking households to support themselves. Strengthening the Pacific Northwest economy and meeting ALICE’s challenges are linked: improvement for one would directly benefit the other. The ALICE tools can help policy makers, community leaders, and business leaders to better understand the magnitude and variety of households facing financial hardship, and to create more effective change. Why undertake the ALICE study? The federal poverty rate is commonly regarded as inadequate for measuring the true scope of financial need in the country. United Way believes in a research-based model in order to fully understand and best respond to the needs of our communities. We wanted to understand the causes of the problems, not just the end results. We also sought to provide objective, comprehensive data that can be used for serious policy planning in every arena. What can we learn from the ALICE study? There is significantly greater need than the typical portrait painted of state, with its high median income and low poverty rates. Additionally, ALICE is a vital part of our community. We are all interconnected and our success depends on ALICE’s ability to reach his or her potential. ALICE is not going away, he/she is here to stay. There is a systemic problem that will not be solved with one magic bullet – policymakers, academics, business and social service agencies need to work together to address long-term systemic change. What is United Way of Pierce County doing for ALICE? United Ways across the country are joining forces to bring this issue out of the shadows and ignite a grassrootsmovement to give ALICE a chance to become financially stable. We are raising awareness that ALICE exists in Pierce County and that we need to address ALICE for the economic well-being of all residents. We are also shedding light on the underlying causes keeping ALICE from succeeding. United Way of Pierce County currently works to provide some short- and medium-term solutions for ALICE, such as free tax preparation and financial and career mentoring. We are also advocating for wide-ranging and long-term policy solutions that get beyond the traditional partisan debates and we are engaging with businesses, government agencies, other nonprofits, the faith-based community and residents to create solutions for a stronger Pierce County. How is the ALICE research conducted? The report uses publicly available data from available sources including the U.S. Census, U.S. Department of Housing andUrban Development, U.S. Department of Agriculture, and U.S. Bureau of Labor Statistics. The lead researcher is United Way ALICE Project National Director Stephanie Hoopes, Ph.D., who works from the Project’s homebase at United Way of Northern New Jersey and is on the faculty at Rutgers University-Newark’s School of Public Affairs and Administration. Each state has an ALICE Research Advisory Committee that is part of the research team and is comprised of top experts from that state representing academia, government, business and nonprofits.